I’ve Got Change in My Pocket! One of the first things I did when I got to Poland was hit the ATM machine in the airport. I think I might have even done that while I was waiting for my luggage to come off the carousel. Since my US dollars weren’t going to get me anywhere here, I needed to get Polish money (Zlotys) so I could take a cab ride to the train station. So armed with a fist full of paper money I headed out the door. 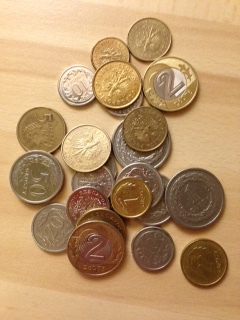 Spending Zlotys is easy….but the biggest difference here is the coins! Americans hate carrying around a pocket full of coins (or a wallet full…it makes our purses heavy!). At “home” I keep a big glass jar on the kitchen counter and I’d periodically throw coins in it when I had too many in my wallet. I lugged my jar of coins over to Navy Federal before I left. Thankfully they have a coin star machine that will directly deposit your money right into your bank account. I emptied my glass jar right into it…I had collected a whopping $137.42! Most of the time I didn’t even like to carry money at all….who wants to carry around a wallet stuffed with one dollar bills? In fact I hardly ever carried cash at all in the US….I used my debit card for everything. Here in Poland, cash is king! They LOVE their cash….and even more embrace their coins! Everywhere you shop they love for you to give them coins! 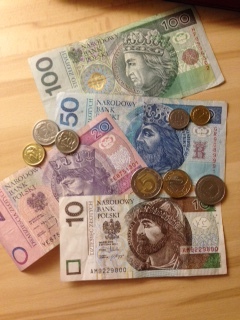 The smallest paper money is 10 zloty…. everything denomination smaller is a coin….5, 2 and 1 zloty coins, and then the “cents” are called groszny (50, 20, 10, 5, 2 and 1….with the coins getting smaller and smaller. So I’ve taken to carrying around coins…LOTS of coins…..but now I need to get a bigger wallet because I have a hard time getting my coins out…and I can’t see them in the dark land of the change compartment of my wallet….and therefore have to dump all the coins out in my hand, hoping that I don’t drop any and they go rolling around on the ground while I’m trying to pay. Because I haven’t learned how to say “OOPS” in Polish yet. I suggest you buy a coin bag! LOL!! Pat. Love your blog. Keep sending us info. It’s fun to read and find out what you and David are doing.